Frog Hollow Neighbourhood House - Everyone Welcome! The Village @ Lord Nelson children’s programs! The waitlist application for our new children’s programs at The Village @ Lord Nelson IS NOW OPEN. Are you an older adult hoping to live a healthier and more active lifestyle, but don’t know where to start? Join our free Choose to Move program to work with an activity coach! We will help you implement daily habits to get you moving, at a pace comfortable for you. Contact Manda at 604-251-1225 ext. 245 to get started! We are bringing our neighbourhood house to you! Look for our Outreach Tricycle in your community! 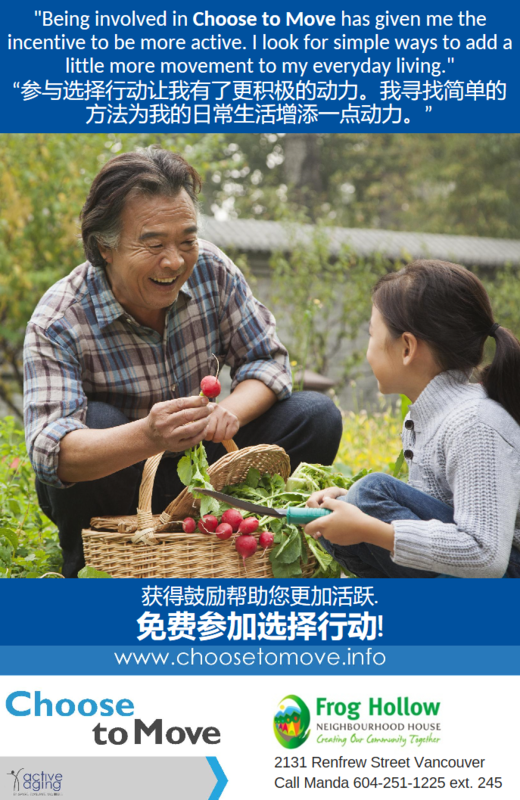 Our goal is to reach out to older adults in our neighbourhood looking for a friendly visit. Our volunteers will gladly bring resources, refreshments, and fun activities to your doorstep! To schedule a visit or volunteer with us, contact Lysandra at 604-251-1225 ext. 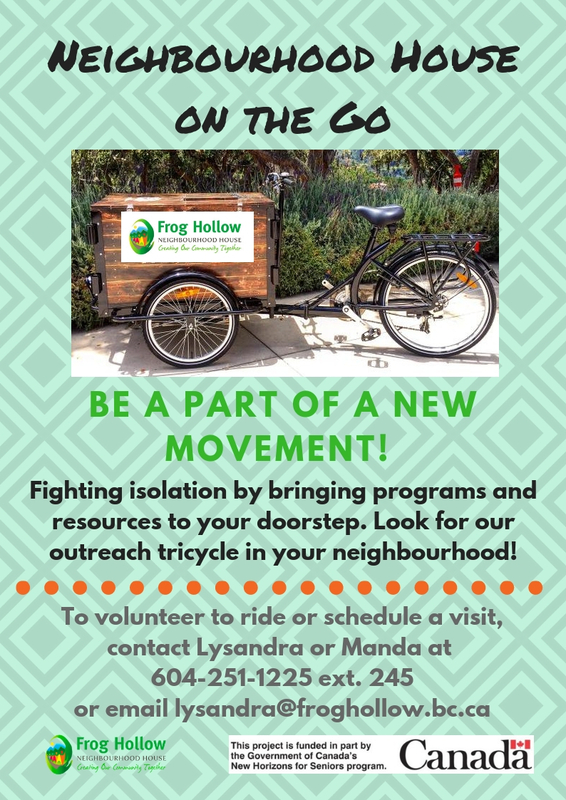 245 or email lysandra@froghollow.bc.ca. Join us on Saturday, April 27th for a free music night event at Frog Hollow Neighbourhood House! Come enjoy our acoustic open stage from local artists. This month, the feature artists are Beverley Elliott and Chris Nowland! Enjoy live music and support local musicians! Event begins at 7:30pm, and doors open at 7:00pm.